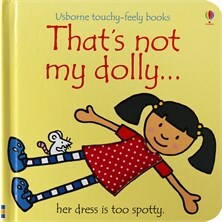 Young children will love meeting the different dollies in this bright touchy-feely book. Features simple, repetitive text and a patch to touch on every page, including bumpy shoes, a soft hat and silky bows. Don’t forget to spot the mouse on every page! Great for encouraging discussion when describing the texture of the touchy-feely sections. It provides an ideal opportunity to extend children's vocabulary in a very active way, and allows for comparison between pictures and the children's own dolls. A durable, colourful book about a child’s most cherished friend – her doll. my daughter received this book at 5 months. she is now 8 months and loves all the touchy feely sections. she remembers where they are and spends time feeling the textured section with her finger tips and finger nails. we have read others in this series and she always selects them from a small selection of books. the textured sections are relatively small which is great for her tiny fingers to explore. i would highly recommend this series for your baby's first experience of touchy feely books.